Adults with prior musical instrument experience (high school, college, etc.) are invited to join the fun. Just come to a rehearsal with your instrument. That's all there is to it! We do not hold auditions; we welcome members of all skill levels. Whether you've just received your music degree or haven't played your instrument in 20 years, you're welcome to come out and play with the band. 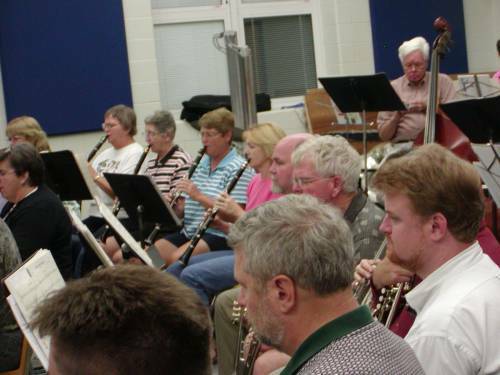 Our regular rehearsals are 7:30 - 9:30 p.m. on Thursdays, August to May. We play music of varied skill levels and hold most rehearsals at the Airport High School band room in West Columbia. We do ask for $20 in annual membership dues. This money is used to fund band events and supplement the grants from the South Carolina Arts Commission, the Cultural Council & the Central Carolina Community Foundation to purchase music, supplies, equipment, etc. Attire for all indoor concerts is formal. Men wear black tuxedos with a black bow tie, black cummerbund or vest, black socks, black shoes, and a white tuxedo shirt. Burlington Coat Factory in the Dutch Square Mall is a good source for reasonably-priced tuxedos. Women wear long-sleeved, long black dresses or long-sleeved black blouses and long black skirts with black shoes. For outdoor concerts, the band wears the community band polo shirts (available for purchase at rehearsals), khaki pants or shorts, and white tennis shoes.